I recently have been working with mixed media works using colored pencil and watercolor. 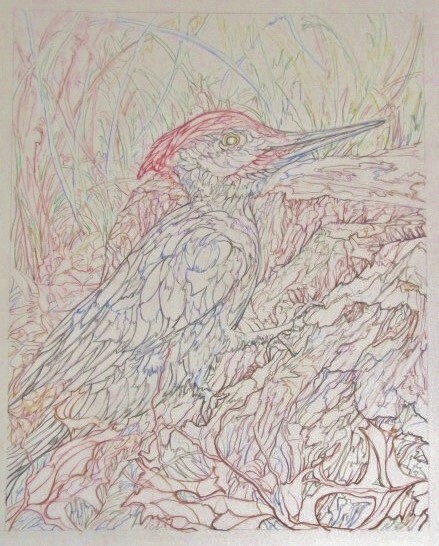 This first piece of a pileated woodpecker is the contour which provides the framework for my drawing. I can’t stress enough how important this stage is in revealing your personality as an artist, demonstrating form in the subject, and laying out your composition. I draw quite blind and by that I mean I keep my eye on the subject and let my hand become a tool of the eye. Prismacolor is one brand of colored pencil I use often. You are currently reading Stages in a Mixed Media Drawing at Dr. Mary McNaughton and Drawing.